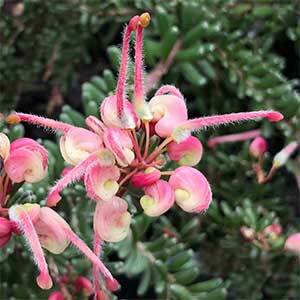 One of the most popular prostrate Grevilleas is Grevillea lanigera ‘Mount Tamboritha’. This is a natural mound forming plant, a neat growth habit and with attractive pink and yellow flowers. The flowers and dense growth habit make this a great plant for attracting the smaller birds to the garden, especially nectar seeking birds. With its neat compact growth habit it has a number of landscaping uses. It is well suited towards the front of the garden border, it also grows well in rock gardens. It smaller gardens or courtyards it can also be from in a container. 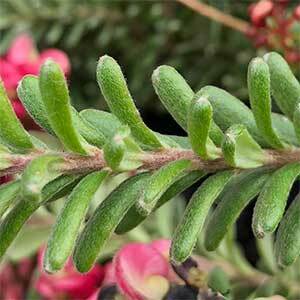 Like all Grevillea lanigera varieties, this is a plant that likes a well drained soil and good air flow. It does not grow well in humid conditions. Consider mounding up the soil in damp areas or heavy clay soils to improve the drainage. Dig the soil over well. Mulch lightly around the plant to maintain a cool root run. Water occasionally through the first summer. Light tip pruning will maintain a bushy compact shape. Best from cuttings taken in summer. Select half ripe tip cuttings. Use a hormone rooting powder. Place cuttings in a propagation mix. Keep just moist and out of full sun. Botanical Name – Grevillea lanigera ‘Mount Tamboritha’ form. Position – Full sun to a a little shade. Climate zone – Cool to warm Temperate. Not suited to sub tropical or tropical areas. Spread – To around .5 to 1 metres. Flowers – Varying from a cream to pink and red, typical spider like in clusters. Flowering Time – From winter to spring, with spot flowering through the year. Foliage – Evergreen, mid to deep green, fine white hairs on oblong leaves. Coastal conditions – Yes, second line.